Bentley ARLFC celebrate beating the Army. 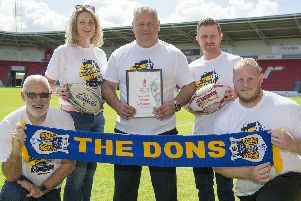 Former Dons winger Dean Colton probably never expected to be playing in another Challenge Cup game when he decided to retire from professional rugby league several years ago. But he was a member of the Bentley team which beat the British Army 18-16 in Saturday’s historic first round tie at Woodside Playing Field. Colton made ten Challenge Cup appearances, scoring four tries for the Dons, and though he failed to add to that tally he could be seen passing on his experience to his younger teammates throughout the game. The 35-year-old, who played for Scotland in the 2008 World Cup, said he still got a buzz from playing in the competition. Reflecting on the fact that supporters almost lined the full pitch, Colton said: “The support was terrific and you could see what it meant to them at the end. “Although they went into the game as favourites we had seen footage of them in action and we knew that we had it in us to beat them on the day if we got it right. “We were terrible in the first half and wasted some good chances. “But we felt that if we cut out the errors and stopped giving penalties away in the second that we could beat them. Proud coach Andy Whitfield said: “We struggled with our completion at times in the first half and we seemed to panic when we got into their 20. “I said to the players that we had to complete our sets better in the second and we did. “I thought our fitness levels were very good and the players all showed a lot of heart. “My heart was in my mouth at the end and I was relieved to hear the final whistle but I thought we deserved to win. 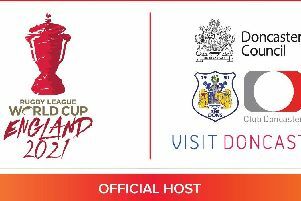 Bentley have been drawn away to NCL Premier side West Hull in the second round. Ties will be played on February 9-10.